Next month, is a big month for birthdays in our family. We have three: my son’s, mine, and my mom’s. My son has a milestone birthday this year. He’s turning 16! Yeah, I can’t believe it either (how am I old enough to have a 16 year old kid!). Where does the time go? He wants a Lamborghini for his birthday. Hahahaha! We had a good laugh over that one. Since I’ve got so many birthdays coming up, I wanted to make sure I got a jump on getting my cards done. One of things I was most excited about in the Occasions Catalog is the Party Pop-Up Thinlet dies. I love cards that have a little something unexpected and these dies are great! This week I’m going to show you a bunch of different cards using these dies and the new Party With Cake Stamp Set. Plus I’m including some unexpected ways to use these dies. To make these pop-up cards, you’re actually going to be making two “cards” – the outside and the inside. One will be 8.5” by 5.5” (outside piece) and the other will be 8” x 5” (inside piece). Score the larger piece in the middle at 4.25” and the smaller at 4”. You’ll want to decorate and stamp your outside card piece. 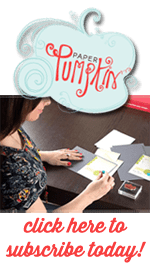 Then you’ll want to die cut, decorate, and stamp your inside card piece. The last step is to glue the inside piece to the outside piece. This is today’s birthday card. 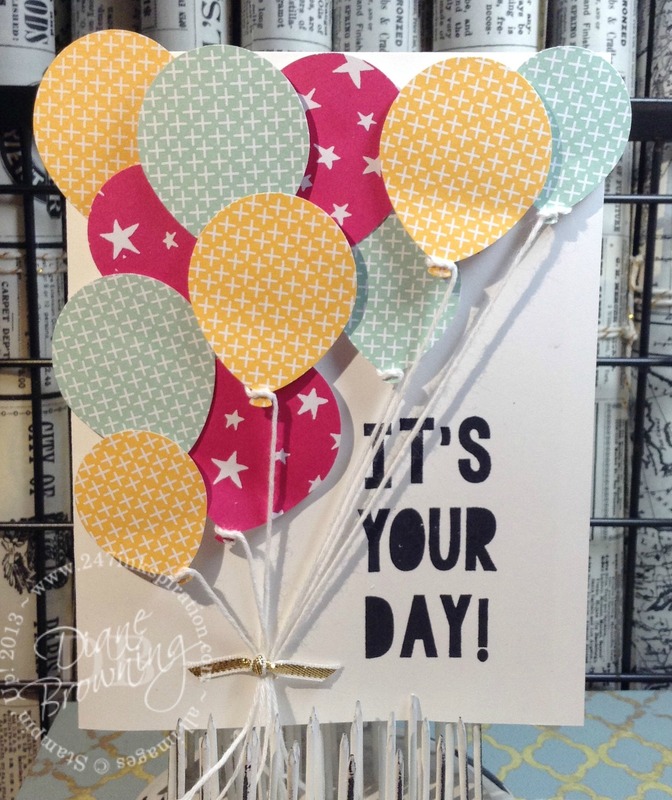 I punched a bunch of the balloons using the Balloon Bouquet Punch in different patterns from the It’s My Party Designer Series Paper and adhered them to the outside card piece using adhesive and dimensionals. The top layer of balloons all have the white bakers twine, which are tied into a bunch with the Gold Ribbon. The die set comes with two different dies to use as pop-ups. Each of the dies have guides on where to place your die for the correct pop-up effect. See those little notches? That will go in the center of your smaller piece – line them up with your score line. 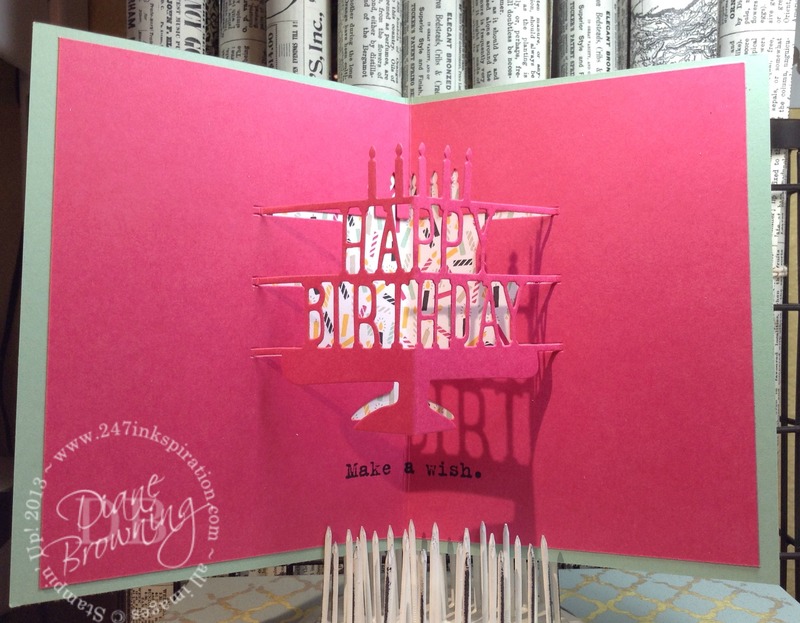 The inside card piece is diecut using the birthday cake and “Happy Birthday”. I added a bit of the It’s My Party Designer Series Paper to the outside edges to tie in the balloons on the front of the card. The pop-up card does take a bit more time to put together and assemble, but it really does have that wow factor when the recipient opens the card. 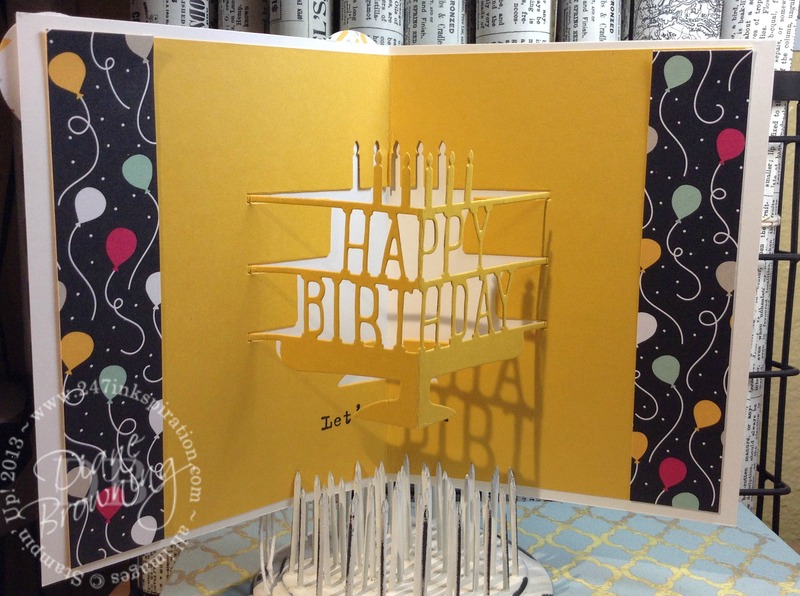 Here’s another idea using the pop-up Birthday dies. 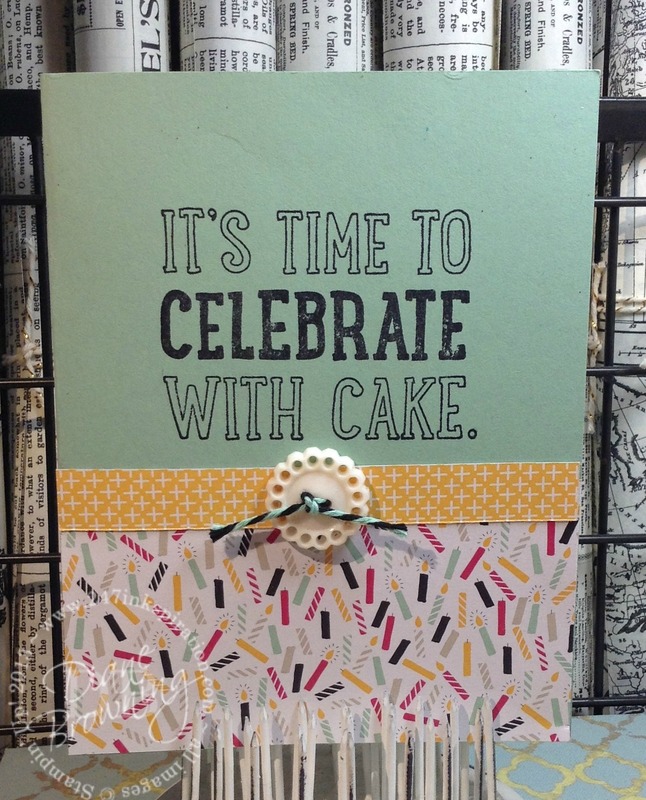 For this inside, I cut a piece of the It’s My Party DSP to a 6″x4″ piece and adhered it to the center of the card. Then I glued the die cut inside on top. Looks like of cool with the pattern paper peeking out from behind the die cut. Birthday cards are a good thing to stock up on. Even though I know the date is coming, I tend to not get them made as early as I’d like to. I can have a couple of these on hand ready to go and it looks like I spent hours making a special card for someone. And it is a special card for someone! I just don’t know who that special someone is yet. I like the 3rd card. What happened to the other one? Great post!! More birthday cards coming all week Poli!